"Hope for the new generations of Vietnamese youth is faith in Christ: the young people who look to a market economy, consumerism, the civilization of looking for new answers for their thirst for truth and new ways of life": this is what the theologian Fr. Joseph Do Manh Hung, Vice-Rector of the Major Seminary in Ho Chi Minh City and Secretary of the Commission for the Clergy of the Episcopal Conference of Vietnam said in an interview with Fides. The Secretary has confidence in the Christian community’s future in Vietnam, noting on the one hand "the government’s signs of openness " and, on the other hand, the flourishing of vocations (over 1,500 seminarians) and 80,000 young lay people committed to pastoral care. 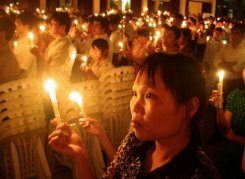 What are the prospects and hopes for Christians in Vietnam? Hopes for the Christian faith is based mainly on young people. The Church in Vietnam has a population of 87 million people, it has 7 million members. And young people are the majority. In 7 major seminaries (2 in the north, 2 in the center and 3 in the south) we have over 1,500 seminarians, and this abundance of vocations is a boost of confidence for us. Faith is strengthened, but at the same time, there is the challenge represented by the opening of a market economy, consumerism, by the civilization of image. This challenge mainly affects young people, including seminarians and future priests who need adequate formation. This work of formation passes through the use and development of modern techniques. As far as evangelization is concerned there are still some limitations, but there is a careful reflection on how togo ahead with evangelization, especially with regards to the formation of priests and laity, so that all the faithful truly mature missionary consciousness. In particular, in the major Seminary of Ho Chi Minh Ville, on the occasion of World Mission Sunday, last October 23, we raised citizen awareness through missionary testimonies. How important is the laity in the Church? When I think about lay people I above all think about young people, who are the driving force for the mission of the Church in society. This is demonstrated by the fact that, of about 80 thousand catechists who are all over the country, in 26 dioceses, almost all are young people. After attending catechism, young people can teach and in turn become catechists. Of course, young people in Vietnam live surrounded by social problems like unemployment and life which, for families, remains difficult because of poverty. But the proclamation of the Gospel to young people is a great challenge that requires a lot of perseverance. What are the relations with the government like? We live in a time when there is a gradual opening of the government towards the Christian faith and the Church. In dark times, such as the one after 1975, the entire country was under communist rule and the seminaries were closed down. They reopened in 1986 and every 6 years the entry of new seminarians were allowed; then every 3 years, then every 2 years, finally, in 2008, the Government accepted new arrivals every year. However, the list of candidates has to be sent to local authorities and have the authorization. Nevertheless, we can say that there has been a marked improvement since 1986, and today we see the fruits. What are the current difficulties the Church experiencies in Vietnam? That's impressive. I think in the US we have about 1300 seminarians.